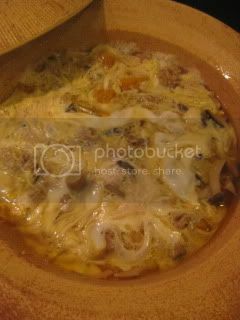 I am an egg lover and I love making "Tamago-toji" with donabe. "Tamago-toji" means "covered with egg", so it basically refers to a dish, finished with whisked egg on top. Egg can be cooked until soft or harder stage according to your liking once it's added. 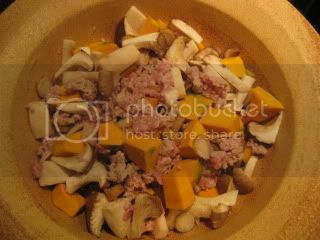 This time, I made "Tamago-toji" with ground kurobuta pork, kabocha pumpkin, gobo (burdock root), and shiitake mushrooms. The combination of ingredients created such a sensational taste. 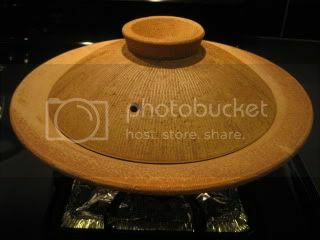 For this dish, I used my light-weight handleless classic-style donabe, "Yu-Kizeto". 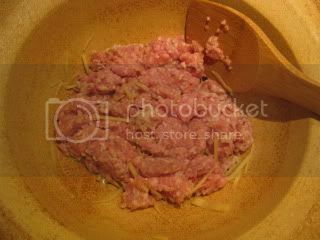 First, 1/2 lb of ground pork and 1T of thinly-sliced ginger were sauteed in a small amount of sesame oil. Cubed kabocha (about 1C), sliced shiitake mushrooms (about 5-6 pieces), and gobo (about 4 oz, sliced into disks, soaked in water for 15 minutes and drained) were added and sauteed for 1-2 more minutes. 1C dashi stock, 2 tablespoons mirin, and 2 tablespoons light-color soy sauce (“usukuchi shoyu”) were added and simmered (with the cover on) over medium-low heat until everything is cooked through (about 10 minutes). 3 eggs (whisked) were drizzled in. Covered and cooked for another minutes, then the heat was turned off and let rest for 1-2 minutes. The dish was served right at the table and served with some chopped mitsuba (Japanese parsley) and sansho pepper powder. So wonderful.